In order to ensure as flexible operation as possible, the temperature switches are fitted with micro switches, which enable the switching of an electrical load of up to AC 250 V, 15 A directly. For lower switching power ratings, such as for PLC applications, micro switches with gold-plated contacts can be selected as an option. All wetted materials are from stainless steel as a standard. 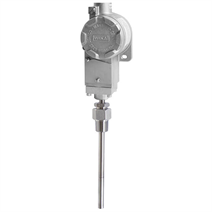 The model TCS temperature switch is extremely robust and guarantees optimal operating characteristics in a limited space with repeatability lower than 1 % of span.